Beyond the marbled halls of Washington D.C., the television studios of New York, and the political correctness run amok on our college campuses and in our largest cities are “the people”. They number in the tens of millions and they are long past Howard Beale’s “I’m as mad as hell and I’m not going to take this anymore”. For the past half century, they have watched as one piece of their America after another has been ridiculed, demonized and disdained by those with noses permanently cocked at an upward 45 degrees. They’ve watched as Republicans beholden to their corporate masters did nothing as “free trade” destroyed jobs, families and communities across the country. Those that escaped the scourge have seen their wages stagnate as Democrats push open borders and sanctuary cities. And through it all they’ve struggled to pay higher food, energy and housing costs for the sake of a climate change meme based upon computer models that to date have been far more successful at being wrong than getting anything right. Yet through it all they have persevered. They plod along, election to election, each time thinking “this one” will be “the one” to set America back on the Constitutional course upon which she was founded. “This” election will be the one where piling trillions of dollars of debt upon future generations will finally be called out for the moral outrage that it is. “This” election will restore the rule of law and secure our borders. “This” election will be the one where un-elected bureaucrats playing “let’s mess with the little people” finally get that pink slip that millions of their fellow Americans already received. Until today. Today, perseverance no longer cuts it. As depressing as the domestic policy is, the foreign policy side of the scale is nothing thing less than a full scale disaster. Refusal to help the Iranian opposition in 2009, support of the Muslim Brotherhood in Egypt, the ill guided invasion of Libya that got 4 Americans killed in Benghazi, failure to honor our signed agreement with Ukraine, a Syrian red line drawn in disappearing ink, Iran openly defying the U.N. Security Council, and now a “JV” Isis team inspiring a play right here on our home court in San Bernardino, California. While the political and media elite are waking up in night sweats over visions of a President Trump they fail to see what’s right in front of them: “It’s the people, stupid.” Those forgotten Americans who have been perpetually ignored as politicians of both parties pander to voting blocs dividing us along, race, ethnicity and gender. In just 75 years we have gone from a nation that birthed the Greatest Generation to an “everyone gets a trophy” – “I want mine” societal suicide pact. That is more than a passing disappointment, that is a national disgrace. 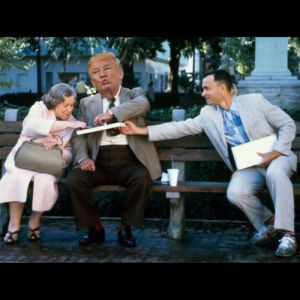 Trump/Gump 2016? Sounds crazy yes, but would it really be any worse that what we’ve already got?